As I finalize our 100 page report from 2015's investigation of Agbogbloshie, there is one overwhelming finding which is simple and brutal and efficient to explain. The most obvious candidates a year ago were things like "this is not remote wetlands outside the city". Or "this is automobile scrap wire, not electronics". Or even, "there are not thousands of children here, there are 25 guys ages 14-34". The tonnage estimate alone seemed like the obvious finding... it's in pounds per day, not thousands of tons per day. No, the number one finding is that NGOs and journalists and photojournalists did not even pretend to do any data research. The number one finding is that data (number of households with electricity, TV, phones, internet) about consumption and generation in Ghana and other West Africa locations has been available for decades. World Bank and IMF have done major studies to support infrastructure and power grid needs in greater Accra, Kumasi, Tamale, Tema and other cities. There was absolutely no need to travel to Ghana to predict what we'd see there. 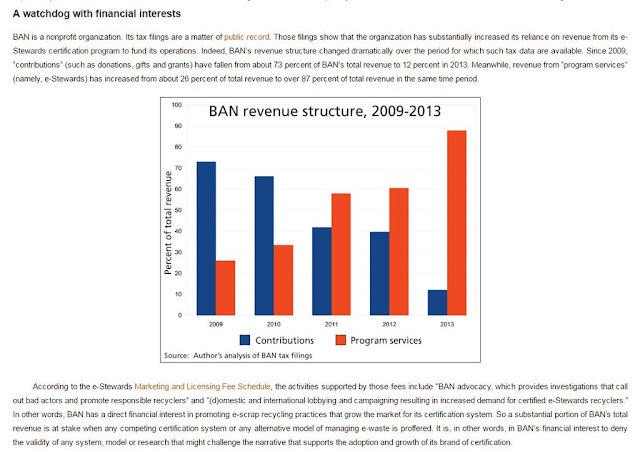 The UNU and other NGO reports had no baseline data for Africa electronics ownership. And yet they had it in spades for EU electronics ownership, so they clearly understood it. The charts showing "flows" of used WEEE and scrap around the world are calculated from generation by EU businesses and households, based on ownership in previous 2 decades. But they didn't get the same data for AFRICAN businesses and households ownership over same 2 decades! No baseline data. As in "this paper gets an F". An NGO cannot possibly determine that 80% of imports are waste or "too quickly disposed" by looking at a dump. It's like making health care recommendations based on a trip to the cemetery. You can photograph a westerner getting a haircut in a foreign city, but that doesn't mean the hair outside the barbershop came from illegal OECD waste. Even if you purposefully sabotage a device and sneak it to a foreign refurbisher - or send a European Rapunzel with exceedingly long hair to the African barber shop - that demonstration does not prove anything. If I say "80% of the apples sold in Ghana had razor blades hidden in them" and then I hide a razor blade in an apple and send it to Ghana and say "see"? That does nothing to support the 80%. But cutting a wire in a TV and selling it to Joe Benson has been presented as a "smoking gun" that most of the trade is sham recycling, supported by photos of a fairly innocuous mount of city generated waste. Neither of these is quantitative, and neither shows causality. So the methodology sucked, but unlike the hair cutting analogy, there is actual data on Ghana business and household ownership... We know how much hair is there to be cut, how much must be generated with 0 tourist hair. Fair Trade Recycling has been trying to make this point for over a decade, but too many editors and journalists told us "but I've seen the pictures". Of children, of wide white eyes on sad black faces with a familiar looking junk VCR in the background. dispose of the eventual electronic scrap the city generated? If C is waste photographed at Agbogbloshie, and D is appliances in productive use by Africans, C + D = A (bad shipments )+ B (good shipments). If you find C, you haven't yet determined that A is 80% of imports. But what you can do is say that 215,000 tons per year is the total of A + B. If 80% of that is bad, then how do we arrive at D - households with devices in use - which is publicly available data? In the absence of a control group (arguably, like India and China which ban import of second hand goods but still generate scrap), baseline data is "Go" in the Monopoly Game of Agbogbloshie. It turns out that using NGOs own figures, without ever flying to Accra, you know they are incompetent or lying, because you cannot reach (D) the number of devices in use, or the teledensity, without a higher percentage of B (good shipments). And if you have D for a decade ago, you cannot have had D without producing C (waste at Agbogbloshie) because even EU generates more C per D than that. Oh, and guess what? By doing actual research before and after our investigation, we found out that the Asian electronics manufacturers all have this data for the purpose of replacing second hand goods sales with a) brand new appliances, or b) refurbished (to new in box standards) appliances, the SKDs they made for decades for the Asian market. Banana peels in the bottom of a monkey cage do not prove that people are illegally dumping banana peels at the Zoo. If you suspect that 80% of the banana peels at the zoo were dumped by OECD recyclers seeking to avoid composting costs, you don't just go directly to the News Outlets and announce it as "fact", and if you do, editors need to make sure it isn't repeated as fact. So the biggest finding is that this data was there all along and no one in the business of accusing Joe Benson and others of "dumping" ever documented it. We showed here in the blog evidence that the UK House of Commons actually cited baseline data in their discussions of "strategic metal" exports and had in their bloody hands the proof that exonerated Joe Benson, but that they wanted their UK shredding companies to have first dibs at it. Aristotle managed to cover this simple logic of causality. Stanford Encyclopedia of Philosophy covers how Socrates and Plato could have killed the E-Waste Hoax if it came up in Phaedra, but that Aristotle took it further and prescribed what you need to do to investigate an allegation. This philosophy, in the "Renaissance" led to the concept of "burden of proof" and "presumption of innocence". Aristotle was not the first person to engage in a causal investigation of the world around us. From the very beginning, and independently of Aristotle, the investigation of the natural world consisted in the search for the relevant causes of a variety of natural phenomena. From the Phaedo, for example, we learn that the so-called “inquiry into nature” consisted in a search for “the causes of each thing; why each thing comes into existence, why it goes out of existence, why it exists” (96 a 6–10). In this tradition of investigation, the search for causes was a search for answers to the question “why?”. Both in the Physics and in the Metaphysics Aristotle places himself in direct continuity with this tradition. At the beginning of the Metaphysics Aristotle offers a concise review of the results reached by his predecessors (Metaph. I 3–7). From this review we learn that all his predecessors were engaged in an investigation that eventuated in knowledge of one or more of the following causes: material, formal, efficient and final cause. Wait... I'm losing you. Readers need less Greek Philosophy, more crybaby photos! Look... basic high school debate class will teach you that flying to a foreign city where you don't speak the language and photographing bodies at a hospital morgue does NOT make you an "expert" in vaccinations, disease, and health care. Photographing yourself with fire in the background wearing a 15 cent Chinese dust mask doesn't make you an expert in anything. You'd be better off staying at home, working as a data journalist, than flying to Accra and interviewing Dagomba migrants who barely speak English. Via internet, you can actually find data like the number of African households who owned a TV a decade or two ago (WTO data available). I took the photo above at the wire-burning ground, but I could have and just as effectively posed in front of a green screen with exotic kids images behind me. People keep contacting me to say they are going to Accra to do a report on Agbogbloshie. Sometimes I want to say "just don't". Spend just the 7 hours of air flight to look up the number of cars in Accra or Lagos, and you have a better idea of the number of junk tires than you would have flying to a car junkyard and counting them, or interviewing school drop outs who don't even know the year they were born, much less anything about sea containers of junk tires some NGO makes up a story about to raise #whitesaviorbarbie funding. The number of people who say "I have been there" is growing, but will never be anywhere near the number of West African exchange students in the USA and EU universities. Some of them are actually confused by the past coverage of Agbogbloshie in National Geographic, Greenpeace, Guardian, BBC, Economist, etc. 12 months ago, I had never been there. But I knew far more what was happening in Agbogbloshie because I had done secondary research. I had baseline data. You need baseline data. 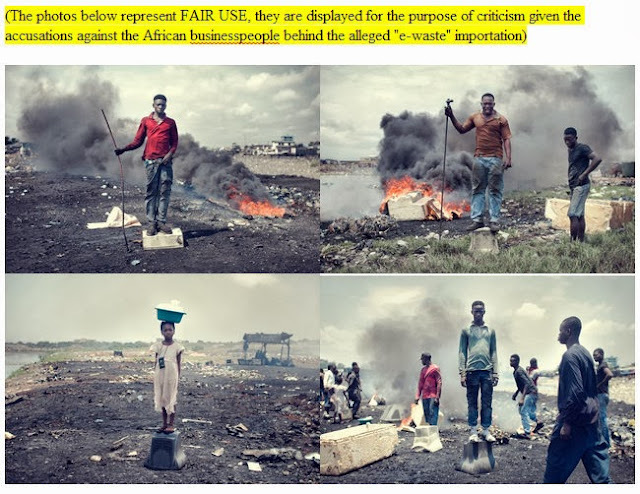 Prescribing "guidelines" for EU customs agents to arrest people like TV repairman Joe Benson without any baseline data on African ownership and generation is environmental malpractice. Without baseline data, you may as well write an essay about cultivating French cheese based on the fact you tasted it. Put some brie and gruyere photos behind your green screen and then start making up numbers (80% is always a popular number) about how much milk to put in it, or how many months it will take for a cheese disk to grow. If you are speaking to Americans who don't know anything about making French cheese, a photo of you in front of the cheese may give you credibility. Caring about the cheese, tasting the cheese, and speaking emphatically about how much you care about the cheese, seems like an important piece of your credibility. You can also go online and find someone else who has written about it and posted a recipe. I have no reason to doubt that this person is correctly reporting on how to make brie cheese. But imagine if someone wrote about making brie cheese and 49 other people linked to their recipe and cited their recipe, and no one ever asked a person who makes brie cheese if it's true. 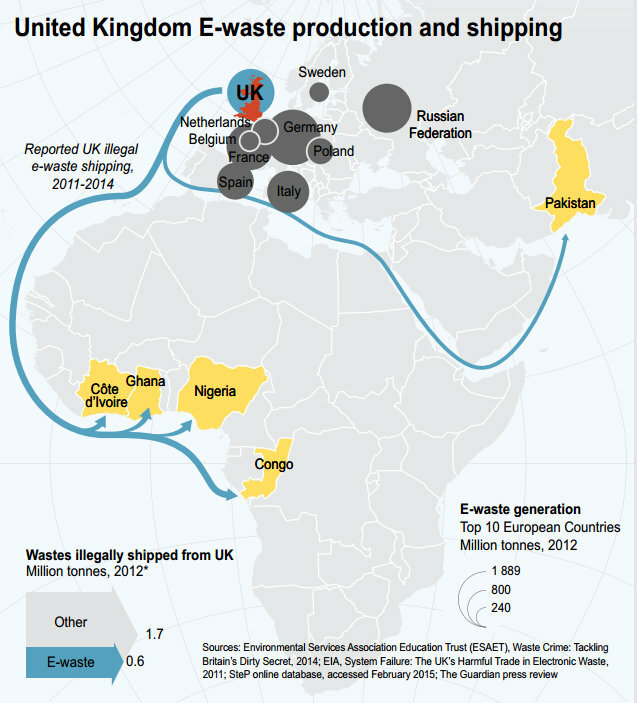 In May of 2015, shortly after my return, United Nations University released a report about "E-Waste" exports which showed the map to the right, and had a headline in the press release that "90% of used electronics in EU were improperly recycled". Most anyone who looks at the map and the headline will suppose they have some facts about shipment of e-waste to the countries (Cote d'Ivoire, Ghana, Nigeria, and Pakistan) on the map. But look at the fine print. It says less than 1% of the e-waste from Europe is exported to those countries! Again, the charts published 12 months ago by UNEP and UNU showed that they had the baseline data for generation in Europe, but then they use fonts and blow up geographic pictures to make it seem like a different picture from what they determined was happening. They actually determined that CRTs and freon appliances were getting thrown willy-nilly into EU metal shredders, and that there was no evidence that Cote d'Ivoire, Ghana, Nigeria, Congo or Pakistan combined wanted any significant portion of them. But the headline was "90% mismanaged" and the images were Kevin McElvany or Bellini or Pieter Hugo race baiting crybaby photos, and maps (!) like the one below which would lead one to believe that there was lots of waste in those blue lines... unless you read the extremely fine font saying it's a nothingburger. Even reports I've been quoting for the last 4 years, 2012 E-Waste Assessment (Nigeria and Ghana), neglected to collect significant and available baseline data. They chronicled the arrival of used equipment, and they visited the morgue (like Dr. Caravanos of SUNY, working with Blacksmith Institute). But none of the reports got baseline data of how many households had the goods ten years earlier, and how they got to the level of teledensity that existed if there was any truth at all the the 75-90% dumping claims by the NGOs. 1. What was pollution was documented in the Odaw River Lagoon prior to 2001? Prior to 1990? 2. How many households in Accra and Ghana had TVs and PCs in 2005? In 1999? In 1989? Without baseline data, you have no control group and no scientific method. If 0% of imported sea containers of electric and electronic equipment were second-hand, what would the generation rate be? Is there any evidence that newer or brand new equipment would have yielded less scrap in Agbogbloshie? If you are photographing bodies at an African hospital morgue to impugn the country's health care, you need to state what would have resulted in fewer deaths. "Less medicine" makes about as much sense as "less reuse" or "more testing". 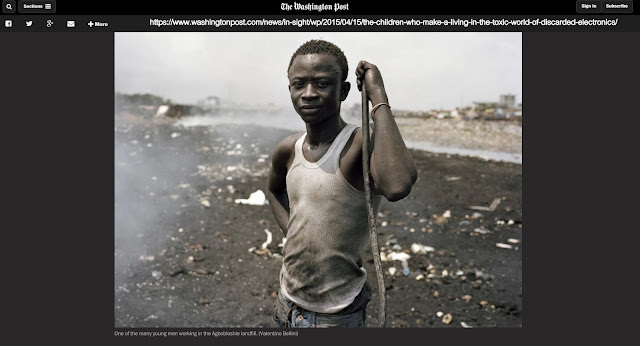 E-waste advocate organizations like Blacksmith Institute, StEP, and Basel Action Network were certainly conflicted in their interest, if not consciously so. Even Interpol, who I do not malign, had earmarked financing for "Project Eden" and jobs were at stake. Photographer Peter Essick of National Geographic took photos of professional electronics exporters like Monitex of Grand Prairie Texas and refurbishers like Net Peripheral of Penang, Malaysia. But he won the photography award for close ups of kids at dumps. It may be financial, like BAN and E-Stewards who make millions of dollars off of fake and fictious dumping allegations. Or it may be a more innocent "white savior" good feeling, like Blacksmith enjoyed "saving" Agbogbloshie with a grant of wire strippers. Or a professor, like Caravanos, may have received nothing more than research funding and congratulations and honor from students and peers. In Caravanos defense, his report for Blacksmith Institute did provide (generate) a lot of baseline data on the number of scrap workers in the Agbogbloshie yard, and their ages etc. Our samples confirmed his average ages of workers (34) and number of scrappers at the site, so we didn't do anything exhaustive (you can actually see how few people work there by looking at the photos). Justin Weinrich, who was there at Agbogbloshie during one of my visits, didn't really let me interview him, but also has drone footage showing the site. Between them, they provide enough recent data to show that no sea container ever has arrived there and that there is not remotely the capacity to manage the thousands of orphans or millions of tons of western waste alleged by the NGOs. Joe Benson would have appreciated them participating with us. Both refused completely to cooperate with our report, even though Washington Post, BBC, NPR, Guardian, etc. were telling a story they knew was impossible. Their interests were in the westerner excitement, what they make, data and photos, is valued by the bogus hyperbole. The takeaway of our report is not that these saviors are corrupt or intend to do harm. They most certainly believe, all of them, that they are doing less harm than good. But our number one finding is that none of them, not a one, got baseline data (though Caravanos and Weinrich provided original data which our report could use as baseline, they didn't seem to get the 1980-2005 period of electronics and car ownership in Ghana would explain a lot more waste than what they could be documenting at Agbogbloshie). My hypothesis is that failing to look for, cite need for, or express concern over baseline data earns an F in most science peer reviews. You cannot know anything about the VHS player hacked apart by young men in Agbogbloshie's scrap yard, other than that it was once imported, unless you interview Ghana importers, consumers, people who sell to the tech sector and buy from it. You certainly cannot deduce any "Guidelines for Testing of VHS Players", which Ghana has not imported for two decades, based on an examination of them in a scrap yard in the City of Accra. And United Nations University's report of 11 months ago, in May 2015, certainly can't defend it's headlines or it's grossly racist description of the prosecution and sentencing of Joseph Benson of BJ Electronics, which it doubled-down on and championed. It was a stick in the eye to us at Fair Trade Recycling, and we have interviews on film of UN funded researchers expressing confidence over Benson's arrest and sentencing, while in the same interview admitting that the "fallout" or percentage of dumping was NOT 70-90%, that reuse was observed at 90%. Here is a load showing difference of certified and non-certified e-scrap. And here is the cost of certifying the e-scrap. The moxie with which European saviors defend their classic mistake of failing to even estimate a baseline for Accra's home-generated, normal scrap, is shocking. That do gooders who save Africa defend their fallacy as if they were defending a high school debate trophy they were given based on an ad hominem or other fallacy. The press is not a jury, is not a practiced debate coach. You have to show baseline data. And this is why our report took a year to release. The more secondary data you document, the more you have to footnote. Every researcher knows that the longer your bibliography, the more months it takes to finish your thesis. 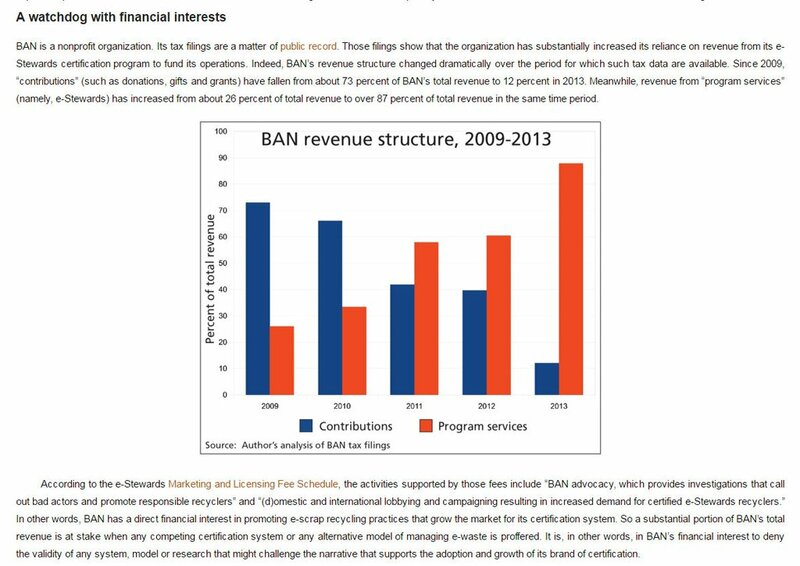 The continued defense or the #ewastehoax, the impugnment of motives of research organizations (like Memorial University) who look for baseline data, that's the cover up, which may be worse than the incompetence. Joe Benson was falsely tried and falsely convicted. I only met him once, never did business with him, and don't know him any better than Atticus Finch knew Tom Robinson on taking his case in To Kill a Mockingbird. But our report has been delayed largely because I AM LOOKING FOR BASELINE DATA on ownership and teledensity. How many injured are arriving at a hospital has to be compared to the bodies in the morgue. It takes time to do it right. Germans are really good, in my experience, at revisiting false heroes.